This year’s ANZAC Day marks the 100th anniversary of the World War I Armistice signed in November 1918. It also marks the 102nd ANZAC Day Parade to recognise those that have and still continue to serve our country. The Dawn Service at Brisbane’s Shrine of Remembrance, ANZAC Square, will start at 4.28am. It will be followed by the Parade from 10am-1pm. All Veterans and their families are encouraged to march and should contact their Ex-Service organisation in advance. If you can not make it into the city to watch or partake in the parade there are still numerous services locally. 5.30am: Service at War Graves Section, Lutwyche Cemetery, 418 Gympie Rd, Kedron. 7.45am: Assemble at Burnie Brae Park (Kingsmill St) for march to Kedron-Wavell Services Club for service at 8.30am. 5.30am: Service at Bellbowrie Memorial in Booker Park, Birkin Rd, Bellbowrie. 7.45am: March from Our Lady of the Rosary Catholic Church car park, Kenmore, to Kenmore Memorial, Kenmore Village Shopping Centre car park, for 8.30am service. 6.15am: Main March at Sid Loder Park, Mitchelton, followed by service at 6.45am. 4.27am: Dawn Service at Geebung RSL Club, 323 Newman Rd, Geebung. 6am: Service at Aspley Hornets AFL Club, 50 Graham Rd, Carseldine. 5.15am: Dawn Service at Croll Memorial Precinct, opposite Sherwood Services Club, cnr Browne and Clewley streets, Corinda. 6.30am: Service at Sherwood Cemetery, 533 Sherwood Rd, Sherwood. 7am: Assemble in Appel St between Verney Rd West and Randolph St, Graceville. March to Graceville War Memorial, Memorial Park, Graceville, for 7.30am service. 7.30am: Service at War Memorial, Keating Park, Indooroopilly. 10.30am: Service at Oxley Memorial Stone, Bannerman Park, Bannerman St, Oxley. 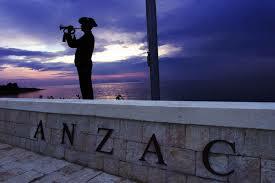 8.30am: Service at Nundah Memorial Park, cnr Buckland Rd and Bage St, Nundah.